Team NutriBullet – The Final Stretch! With three weeks left until the Asics LA Marathon, I’m literally in the final stretch of my training with Team NutriBullet! If you missed my previous posts and am unfamiliar with Team NutriBullet, you can read about my training here and here! 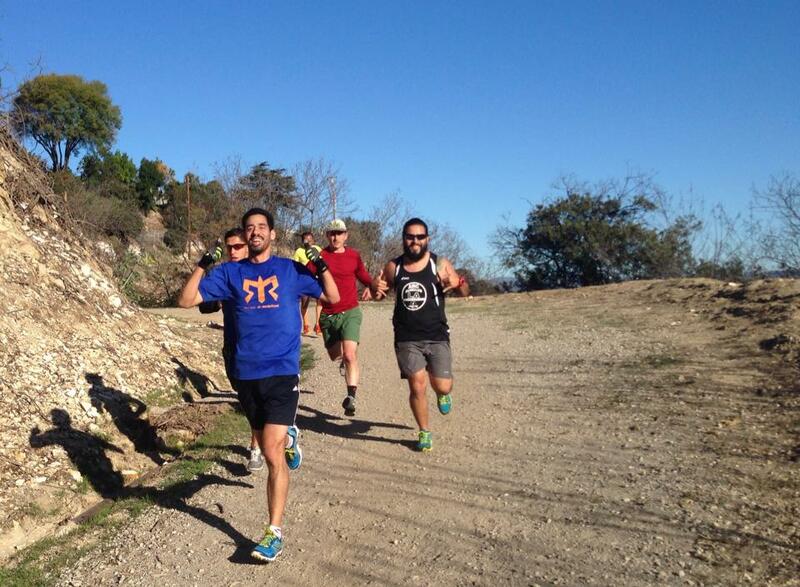 This Saturday morning was Team Nutribullet’s final long run before the LA Marathon. 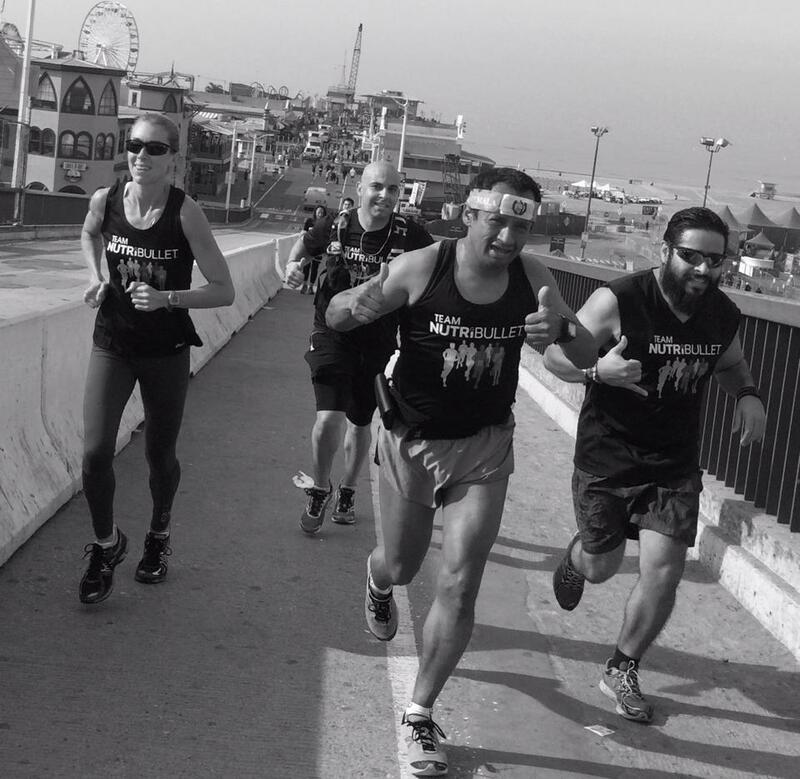 We ran from Joes gym to Marina Del Rey and back one of our rare long runs that did not include a tribal run or loops around a park. It served as a dress rehearsal of sorts for the LA Marathon. 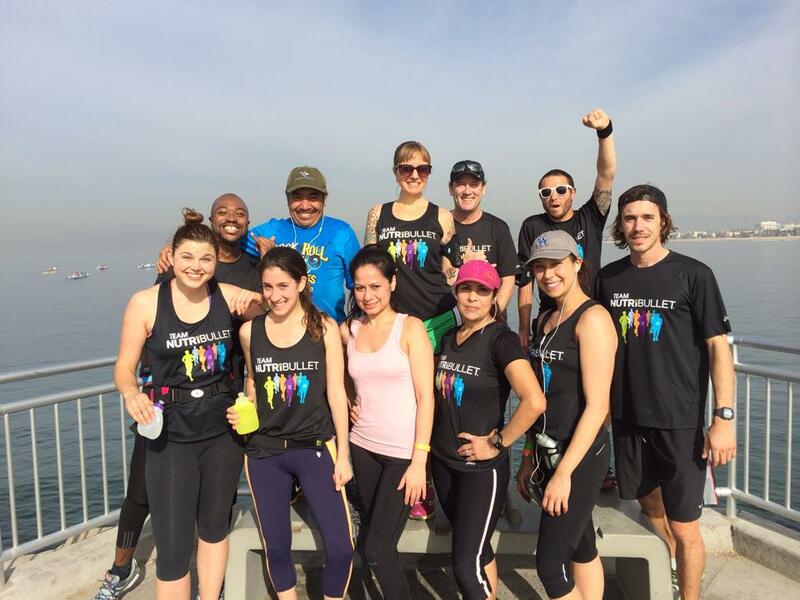 We were all wearing our Team NutriBullet gear, we stayed in our groups and ran our paces. I had the honor of “leading” the 8 minute pace group! I say “leading” because at this point in our training we are pretty much a well oiled machine! We stayed together and hit our target pace for most of the run, though some nagging pains forced a couple of runners to fall back a bit. 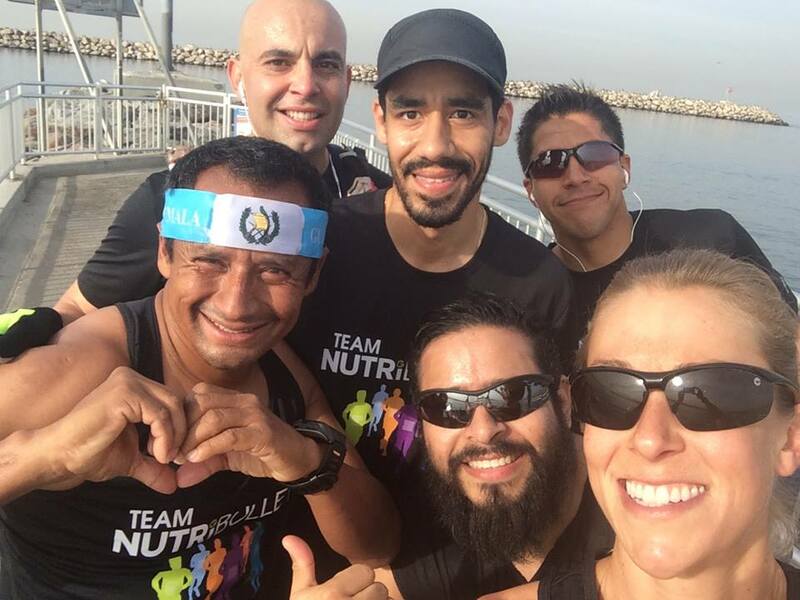 I had the honor and pleasure of running with 2 sub-elite athletes and members of the Los Angeles Speed Project (LASP) Crispin Lazarit and Cynthia V Zarate, who were both original Team NutriBullet Members! For our groups final 20 miler this was a great opportunity to pick their brains and get some great marathon advice from 2 runners who have both qualified for Boston many times. For me, personally, it was a huge boost of motivation to run with them and I just felt the positive energy and good vibes! As happy as we all were to run with them, they were both very gracious in joining our group and running those miles with us! This 20 miler was the culmination of a training program that started in December and will bring us all to the starting line of the LA Marathon as stronger, healthier runners! As I’ve mentioned in my previous posts about Team NutriBullet, we have lots of expertise at our disposal, from dietitians and nutritionists, to strength and fitness trainers to running coaches. All of this, to impart wisdom to all of our teams runners, to help us all to be more balanced as athletes. In short, all of these areas are important, proper diet, strength and core training, and running form all make for a much more successful running experience when applied! When I was asked to be a member of Team NutriBullet, I was also asked to be a pace group leader, which was a great honor for me, and not an opportunity I took lightly! I was asked to pace the 8 minute group, which was a bit nerve racking in the beginning since I didn’t know how many runners would actually be in my group! For the first 2 group runs there really wasn’t a set established 8 minute group, but slowly the group came together! Looking at what it is now, all of the runners are exactly where they need to be! Being able to keep a conversational at a specific pace is one tell tale sign that its the right pace for a long run! As much fun as I’ve had pacing the 8 minute group throughout this training program I have been willing to do what has been asked of me! Some weeks this meant running as a “tribe” during the first few miles of our long run! 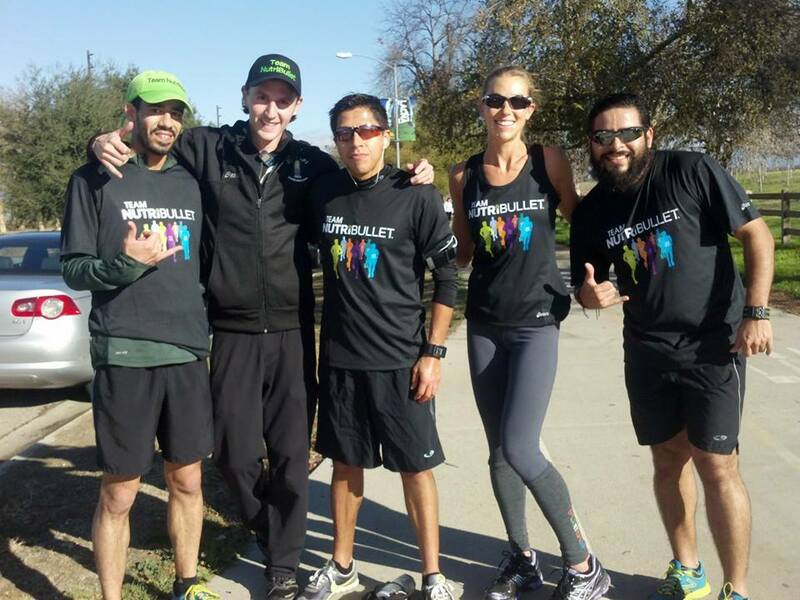 This “tribal run” helped to unite the group and give runners in different pace groups, who would not otherwise have the opportunity to run together or strike up a conversation to do just that! I have also had the pleasure of leading the 10 minute pace group for 2 weeks due to necessity by the group. I’ll be honest, in a small way I dreaded my first run with the 10 minute group because I thought it would be much too slow for me, but something happened, I settled in and enjoyed it! Actually, I enjoyed it a whole lot!! So much so, that when I was asked to pace the 10 minute group again the next week I was happy to take the task! I have learned that every pace group brings their own energy! Their own goals, and their own experiences! When I went back to running with the 8 minute group it was bitter sweet! I was thrilled to re-join my 8 minute group, but sad to leave the 10 minute runners as well! I almost wished both groups would run at a happy medium pace, but that wasn’t realistic for anyone involved! So what’s next? 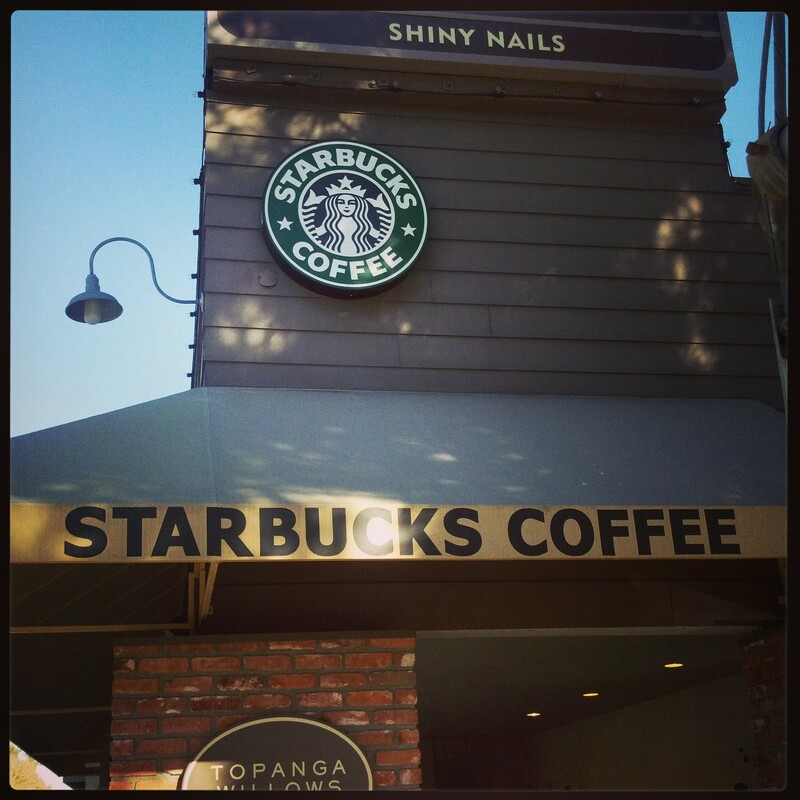 It’s time to taper and rest up for the LA Marathon! 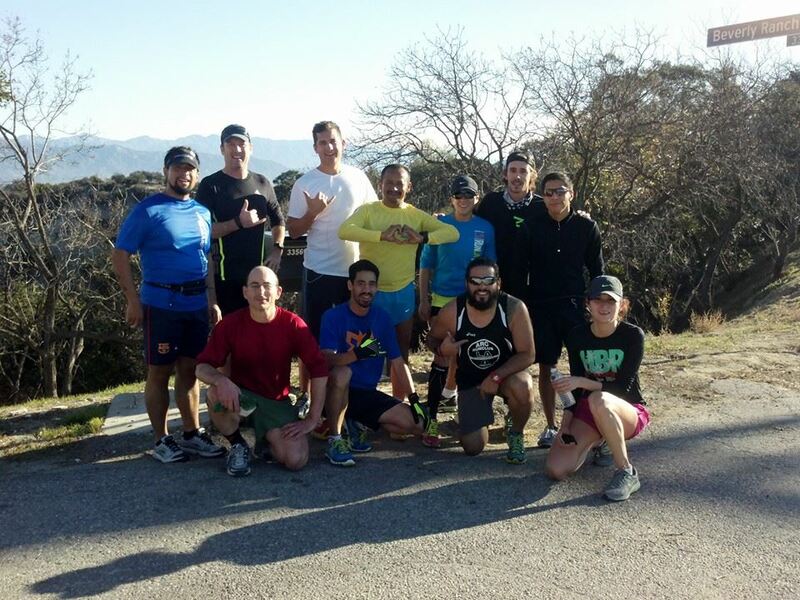 We still have a few group runs left before March 9th, but the core of our training is complete! I am extremely proud of everyone who has trained with our group, and am hopeful that everyone will reach their goals! Whether its a first marathon, a PR attempt or a BQ attempt I believe everyone is now in a better position to achieve what they are set out for! For those runners dealing with nagging injuries, now is the time to heal up and get healthy for race day! 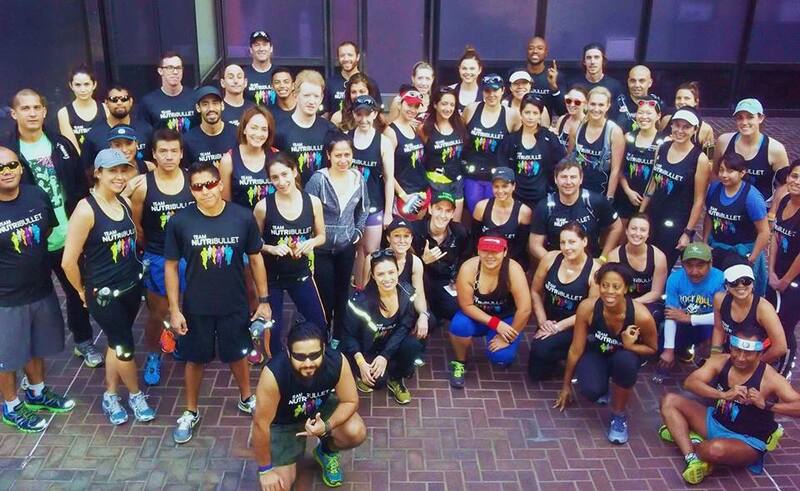 I am thrilled to share my LA Marathon experience with this group, and when I wear that Team NutriBullet logo on my chest and back I will be representing the entire group proudly! There are so many great people in Team Nutribullet so in my next point I will try to share about some of these amazing individuals! 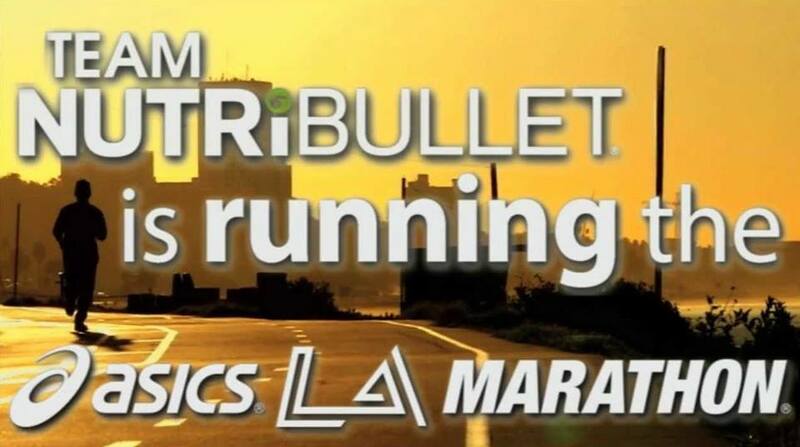 I posted early this month about my new adventure with TeamNutribullet, training with 70+ runners for the 2014 LA Marathon. Only 4 weeks later and this amazing group is already 1/3 of the way through our training! 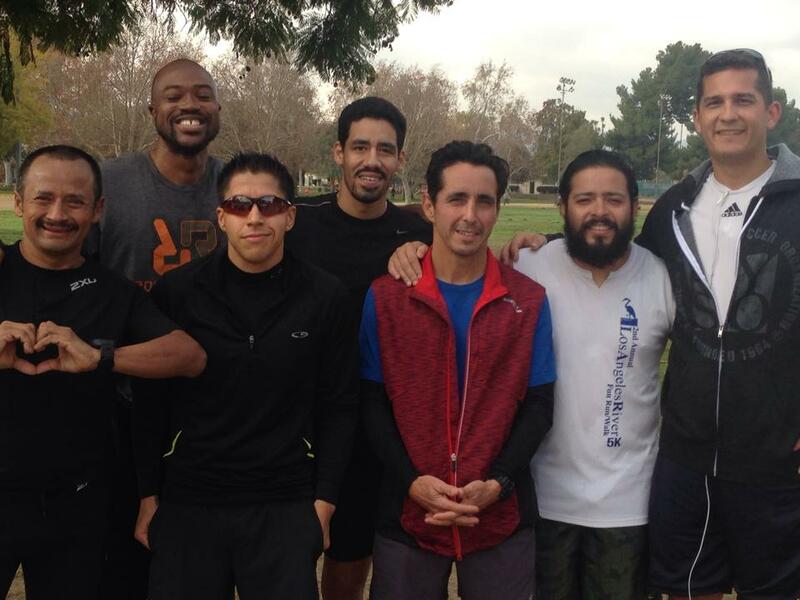 Starting off the first Saturday at Joes Gym in West LA, the team completed an indoctrination process which included a medical screening, mini form clinic and a short session with a strength coach before moving forward with our 6 mile run. Our run locations have rotated between the West Side (running on San Vincente) and the Valley (climbing Dixie Canyon); they have become longer each Saturday extending as far as 10 miles so far! Running Coach John LaPointe whose ABC’s of running have become extremely popular, and effective with the group! He leads the Saturday group runs, and the Monday recovery runs. Strength and Conditioning Coach/Trainer Monique Richardson who is whipping us into shape and ensuring we develop the core strength that will carry us through our training and the 26.2 mile LA Marthon! Having Joes Gym at our disposal doesn’t hurt either! Dietitian / Nutrition Coach Sarah Lefkowitz who has been tending to all of our nutrition needs and questions. No matter how good a vehicle is, it won’t take you very far without fuel! Proper nutrition is the fuel that carries runners through a long training program and through a Marathon. Having a NutriBullet to make daily NutriBlasts have been a huge benefit to all of the runners on Team NutriBullet and Sarah has been fantastic about giving instruction and answering all of our questions! In addition to being lucky enough to run with Team NutriBullet, I was also selected to be a pace group leader! This is an honor for me and something I don’t take lightly. Thus far I have paced both 9 minute and 8 minute pace groups. I try to keep the group on target pace, share some advice, re-iterate proper form, keep everyone motivated, etc. There are lots of runners with different goals and its a pleasure and honor for me to help in any way I can! While this will be my 7th Marathon over all, and 3rd LA Marathon, I have learned a lot so far through these weeks of training. Things that are making me a better runner, for sure! Here are the things I’ve learned so far! 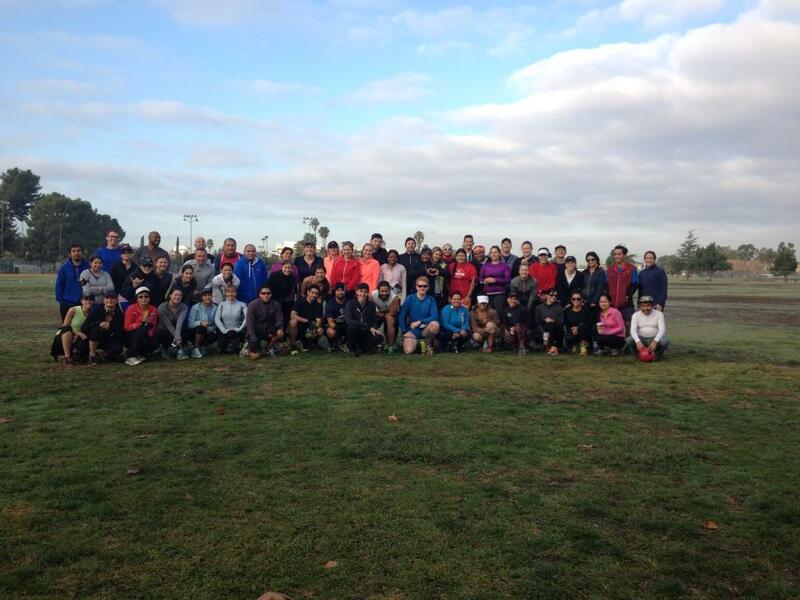 I miss running with others – a lot! – I do most of my training runs on my own during the week. Occasionally someone will reach out to me and ask me to run, and I’ll usually join them. However at this point I can’t COMMIT to group runs during the week. While running on my own allows me to focus on the workouts that I want to do, it can also get a bit lonely. I committed to the Saturday runs and I’m glad I did!The energy I get from all of the other runners is absolutely wonderful! I learn so much and continue to be inspired! Being a part of something bigger, a united effort, just makes me want to give my best, and so I do! Now more than ever, I’m convinced that Runners are just the nicest people! No matter what pace group I may run with this is just an amazing benefit to me and I’m sure it is to others! The importance of proper nutrition! – I have a confession to make, I have not had the best nutrition as a runner. As a runner I always thought one of the benefits was being able to take liberties with my diet! “Well, I just ran 10 miles today so I’m going to eat whatever I want!” right?… wrong!!! While I would say that its okay to treat yourself and indulge now and then, unhealthy eating is not a pattern that is beneficial for optimal running performance! Proper diet and nutrition, however can go a LONG way in providing useful energy and simply making a runner feel better! I can say that using the NutriBullet every morning has absolutely provided me energy for my morning runs and then some!Still, I’m not completely there yet. I am motivated to making a change in my overall diet! I have already started making healthier choices, but I will have some work to do! Coming into the training I was taking supplements to help with a Vitamin D deficiency, and my Total Cholesterol (TC) count was borderline high. I am expecting that by the end of this training program those will be 2 non issues! Commitment and discipline is key to success! – Like most runners out there, I have personal goals. I have reached some, and have missed others. In 2010 I ran the Philadelphia Marathon (3:12) and came within 2 minutes of my main goal – qualify for the Boston Marathon. After that race I wasn’t disappointed – nope, not at all (after all I had just ran a huge PR that race)! Rather I was determined to qualify for Boston on my next race. I convinced myself that I still had the fitness, and as long as I ran regularly and followed some sort of training program, I would get even better.My next training “program” was full of holes. It was patch work, and not consistent! I didn’t care that Pasadena was a tougher course with more hills than Philadelphia, and less than ideal weather. I didn’t consider that, while I never struggled during the Philadelphia Marathon, there were other factors that helped. Nope! I ran the 2011 Pasadena Marathon under prepared, but with a false sense of confidence that would be my downfall. My time (3:21) was respectable, but it wasn’t what I wanted, or expected, so I became a bit angry, depressed, and unmotivated. My training got better but still no where near consistent. I ran the Ventura Marathon in September, aiming for a tougher BQ (3:05) and again falling short (3:16). I ran the early miles way too fast, throwing strategy out of the window!For the LA Marathon, I am taking all of those lessons, applying best practices and introducing all of the things I’ve learned with Team Nutribullet. My mileage is up, I’m training smarter and I’m incorporating speed work and different types of training runs to mix it up. Most of all, I am committed to this training program and am applying discipline in following through with it! An important element for me in striving for success is that I am Singular Focused. I have decided that during my LA Marathon training program I am not going to worry about any other races, or events, its all about doing what needs to be done to make sure that the LA Marathon is a success and I am able to reach my goal! Thankfully I have a fantastic group in Team NutriBullet that is supporting me and the rest of the runners in this great journey! I am so excited to be on this journey! Every runner has goals that they are striving to reach, and I’m hoping that I will achieve mine through my training with Team NutriBullet. More important than that, is learning lessons that will carry with me throughout my life, and throughout my running endeavors! I would be blessed to continue to run for many years. I read stories about Masters runners who are accomplishing amazing feats! You don’t get to that point if you don’t run smart and take care of yourself! So my MAIN goal for 2014 and beyond, is to sew the seeds of lifelong running! As an avid runner I enjoy finding ways to make my runs fun and interesting. I even wrote a blog post about how to enjoy running. 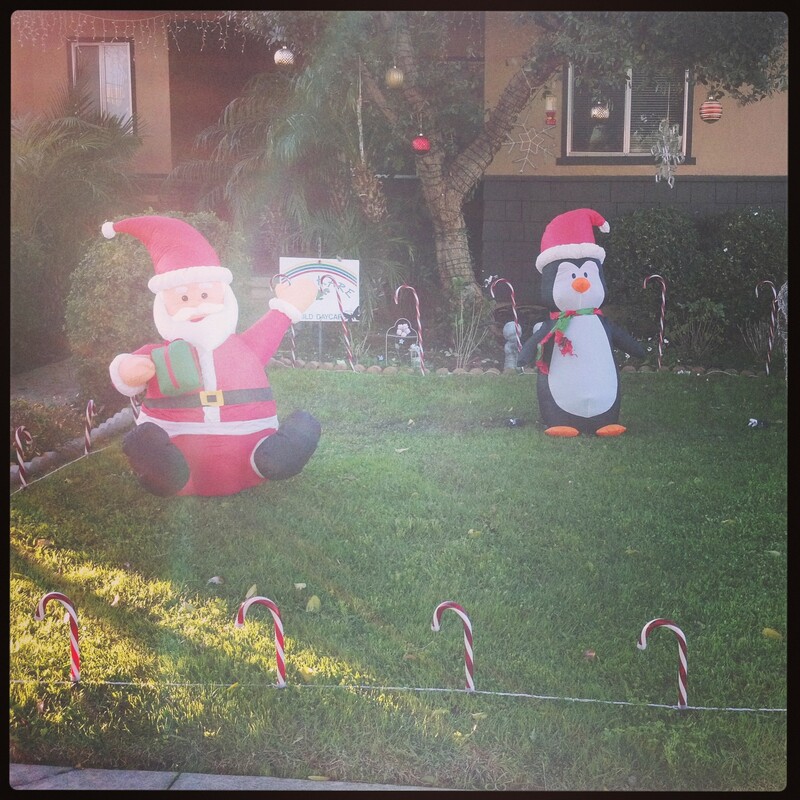 One of the things that has added some fun to my running in the past month has been a Contest / Scavenger Hunt started by therunchat.com called Holiday to Holiday #RunChatHunt. The purpose of this unique event is to find the particular items on this list during a run, take a picture and upload to Instagram/Twitter with the tag #RunChatHunt. 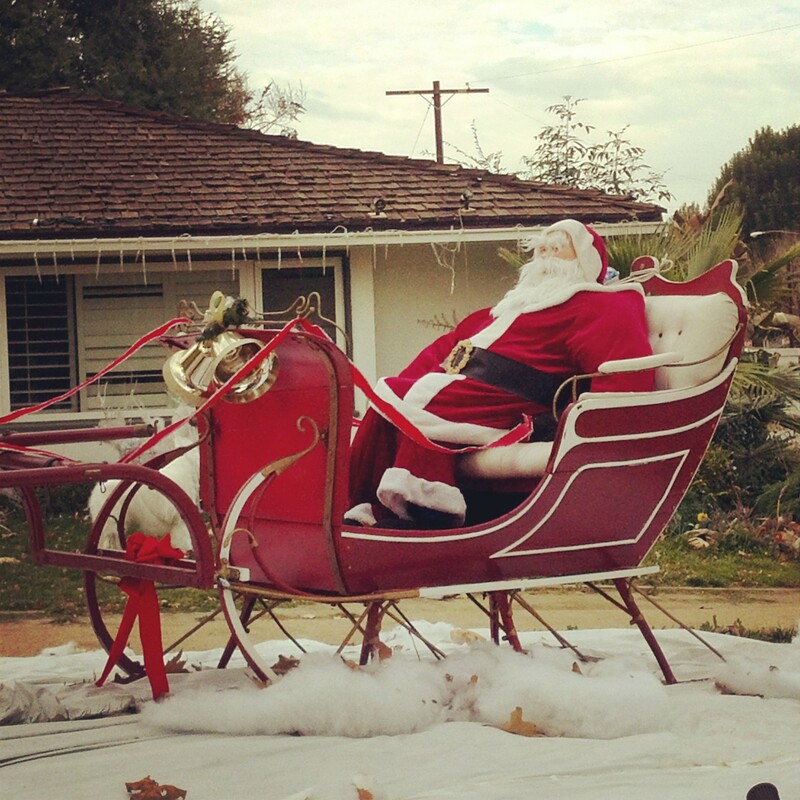 Each picture counts as an entry to win a number of different prizes! Honestly I had so much fun with this I wish there were more things to find! 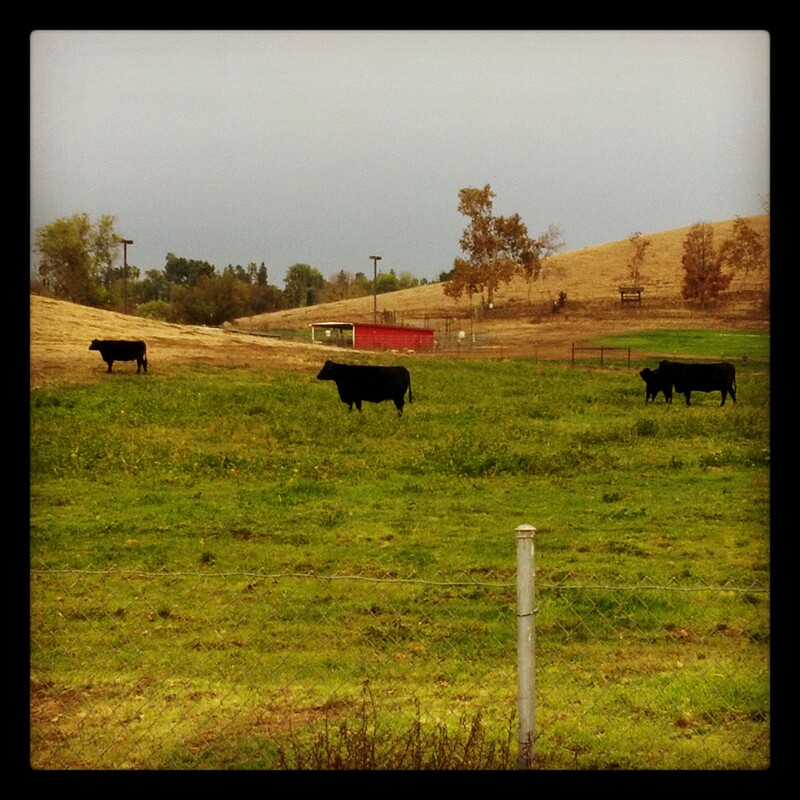 At the very least it opens up your mind to the interesting things you can see on a run! 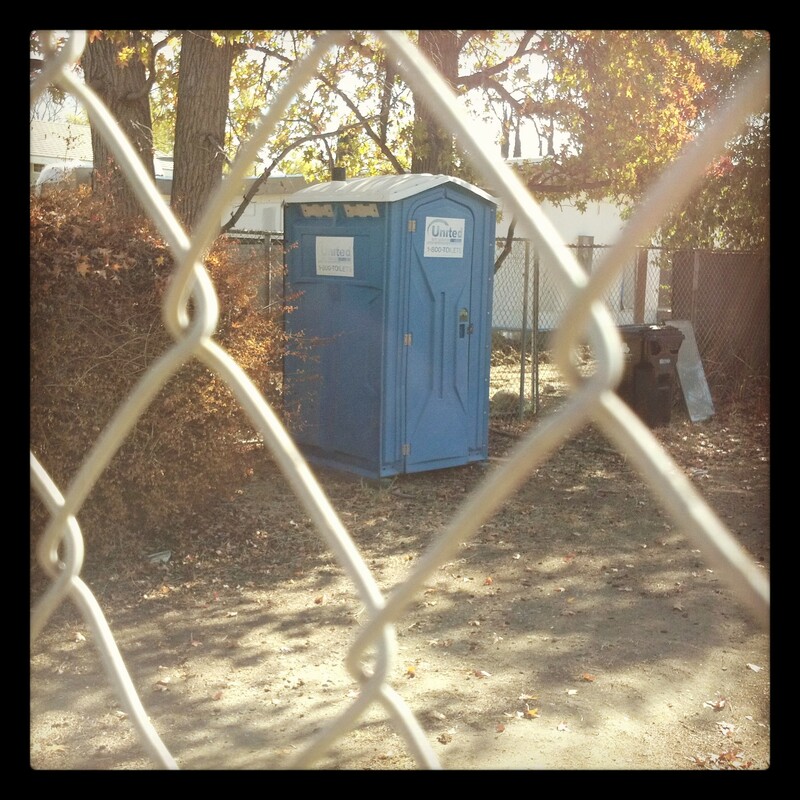 Okay maybe a Porta Potty is not exactly interesting, but you get my point! 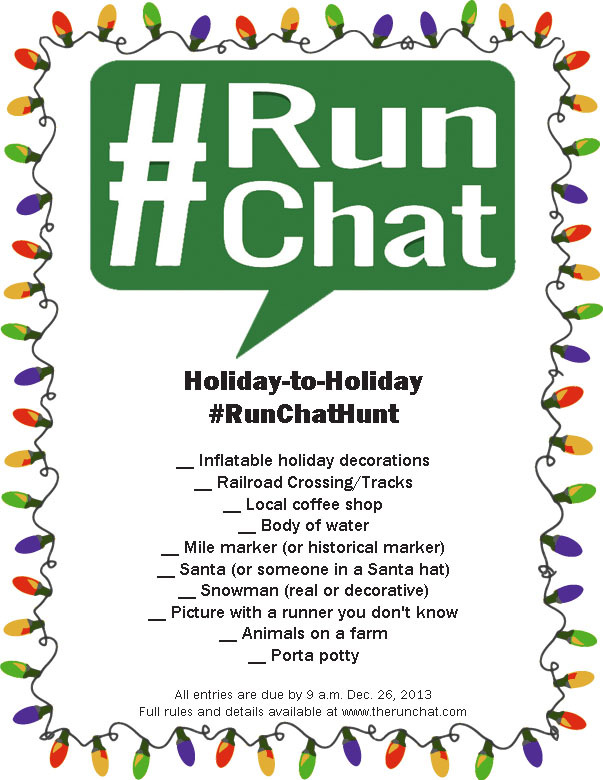 Yesterday I learned from @RunChat that I won a prize in the #RunChatHunt Scavenger Hunt/Contest! What I won is a Camelback Arc Quick Grip hydration bottle! I actually had my eye on one similar! And for my next adventure: The ASICS LA Marathon! 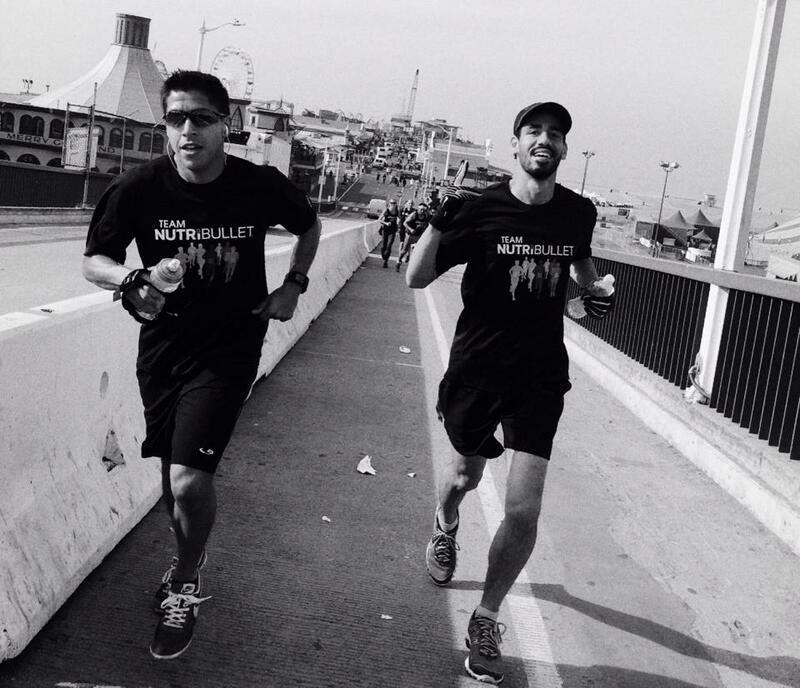 The Team NutriBullet LA Marathon Training kicks off on Saturday! When I think of Thanksgiving I there are many traditions and memories that come to mind. The food (Turkey, Stuffing, Cranberry Sauce, Pie, etc. ), being around family and friends, having everyone share what they are thankful for, watching the Thanksgiving Day Parade on TV! For runners, there is another tradition: Turkey Trots! Turkey Trots are all the rage, and is a tradition as old as running itself. The Buffalo Turkey Trot, for example claims to be a few months older than the Boston Marathon. It’s the reason why Thanksgiving has overtaken 4th of July as the #1 day for Road Racing in the US. Chances are there’s a local Turkey Trot in your area. Turkey trots are seen by many runners and non-runners alike as a way to have a guilt free thanksgiving meal. The 5k distance, fun environment and non-competitive atmosphere is especially appealing for beginners. Living in Los Angeles, there is no shortage of these races available to me. Still, I have yet to participate in an organized Turkey Trot. I know, blasphemy right?! To be honest, it’s never been high on my list of priorities! Even still, there are reasons (or excuses as some will say) as to why I’ve never run a Turkey Trot. The closest I’ve come to running a race on Thanksgiving was The Philadelphia Marathon, after which I stayed in NJ to spend Thanksgiving with family. This year has the potential to break that trend. My wife and I celebrated Thanksgiving early due to family being in town. I’m not planning to go anywhere, and Marathon was in September. I already have my eye on a couple of local races, and if I do, in fact, break my no Turkey Trot streak, I’ll be sure to share my experience! 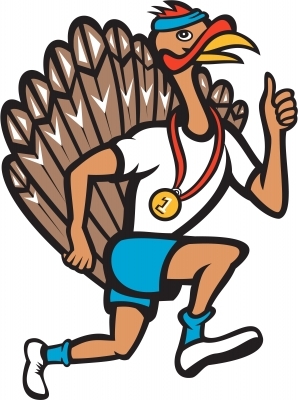 In the mean time, I want to hear about your Turkey Trot experiences, let me know what I’m missing!